Get even more from the Scottish Caravan, Motorhome & Holiday Show in February 2018 by hiring professional promotional staff from Promotional Models Scotland. From 8th to 11th February 2018m, the Scottish Event campus (SEC) will be full of life as caravan, motorhome and holiday brands bring their products and services to the thousands of customers who enjoy motorhomes and caravanning. As a business, you know how important it is to make the most of every hour that the show is open to the public. But it’s tough standing out, which is why professional promotional staff are worth the added expense. But here’s the thing: the return on investment of hiring promotional staff for your stand are many and varied. A busy show – it has attracted 25,000 visitors in the past – it is growing in popularity year on year. This is why the exhibitor list just keeps on growing too. From caravan manufacturers to small-scale producers of related accessories and products, this year there will be marine manufacturers attending too. This diverse audience is great news for your business but unless you have the energy, will you really tap into its full potential? Our promotional staff are trained but also fully briefed on how to make the show a success, not for them, but for YOU. We talk a lot about professionalism simply because it is one of the most important factors, as far we are concerned. You have a brand, something that you have worked hard to create, develop and sustain. You need your customers, current and potential ones, to really see what you offer. And this means that no matter who is fronting your stand, whether that is welcoming visitors or sales staff, they need to carry your brand for you. And that means people who turn up on time, look the part and work hard and smart for the duration that they are with you. 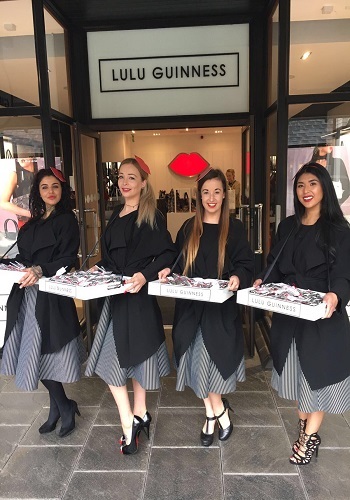 Our promotional staff are experienced and versatile, meaning that you can hire the staff with the expertise that you really need. Many brands use the Scottish Caravan, Motorhome & Holiday Show as a means of generating leads. In other words, expanding their database of potential customer contacts. If that is your goal for this exciting show, then our staff will make that happen. •Demonstrators – new products are all well and good but sometimes, demonstrating them is the most effective way of achieveing higher sales. •Product launches – with such a ready audience, it makes sense to launch a new product in front of thousands of people. 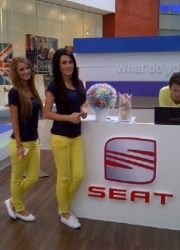 Again, our promotional staff can be the driving force that attracts attention to your product and brands. •Sales – we also have sales promotional staff who have the training, experience and ability to create more sales for you. •Meet and greet – there are also times when you need promotional staff to ‘do the small talk’, make connections and create interest in your stand so that you can work your magic. * This is by no means an exhaustive list of the abilities of our staff. If you another idea or need help to bring it to life, just call us! You can also hire admin staff, the people who ensure that everything about your stand remains in tip-top condition. For a tailored and competitive quote to hire promotional staff or exhibition staff the Scottish Caravan Show contact the admin team at Promotional Models Scotland now by completing the form below or call us on 0844 800 0071.